It's a classic tiki drink but you don't normally see a Jungle Bird served as a sparkling cocktail. Light and dark rum meet Prosecco in this updated classic. 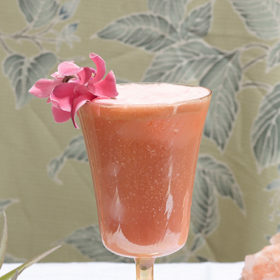 The rosy-red Jungle Bird is a classic tiki drink not usually served as a sparkler. This revised version splits the rum component between light and dark rums (usually, it’s all Jamaican or blackstrap rum). It has a lighter, less sweet flavor profile compared to the original. In cocktail shaker, combine first five ingredients with ice. Shake well, and strain into Collins glass over fresh ice. Top with Prosecco. Garnish with dried pineapple ring. Serve with straw.